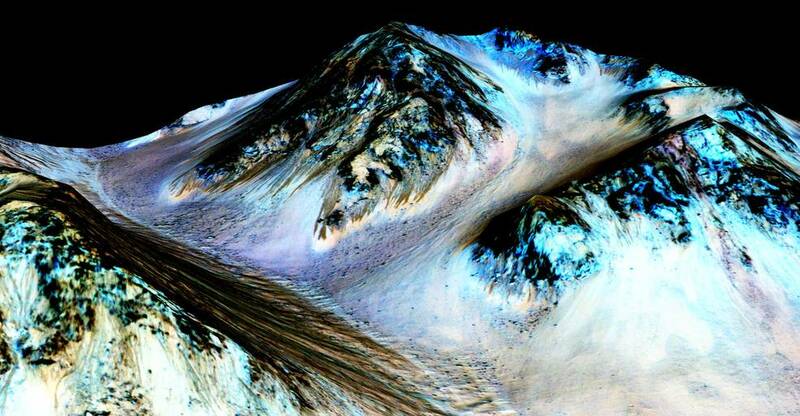 "Our quest on Mars has been to 'follow the water,' in our search for life in the universe, and now we have convincing science that validates what we've long suspected," said John Grunsfeld, astronaut and associate administrator of NASA's Science Mission Directorate in Washington. "This is a significant development, as it appears to confirm that water - albeit briny - is flowing today on the surface of Mars." Ojha first noticed these puzzling features as a University of Arizona undergraduate student in 2010, using images from the MRO’s High Resolution Imaging Science Experiment (HiRISE). HiRISE observations now have documented RSL at dozens of sites on Mars. The new study pairs HiRISE observations with mineral mapping by MRO's Compact Reconnaissance Imaging Spectrometer for Mars (CRISM). 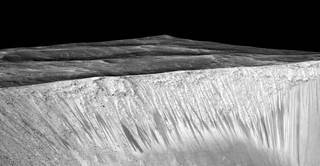 "When most people talk about water on Mars, they’re usually talking about ancient water or frozen water," he said. "Now we know there's more to the story. This is the first spectral detection that unambiguously supports our liquid water-formation hypotheses for RSL." The above story is reprinted with permission of Technology.